I had a setback, just after Christmas, when I was admitted to hospital with abdominal pains that led to me having my appendix removed; very tidily via ‘keyhole’ surgery. This forced me to stop everything for a while but it also provided me with an opportunity to try out media and subjects that I’ve neglected for too long. 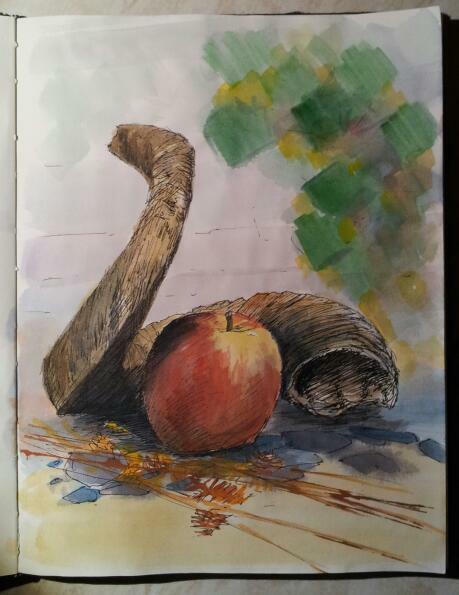 I set up a simple still life composition and picked up some old Conte pastel pencils that I was given many years back. I had forgotten how pleasant it is to build up colours and tones slowly, without the urgency imposed by rapidly drying watercolour or acrylic paint. There is a pleasing feeling of control of the process with dry media that I find can help to deepen my observation of the subject. This is in turn beneficial when I decide to use paint. 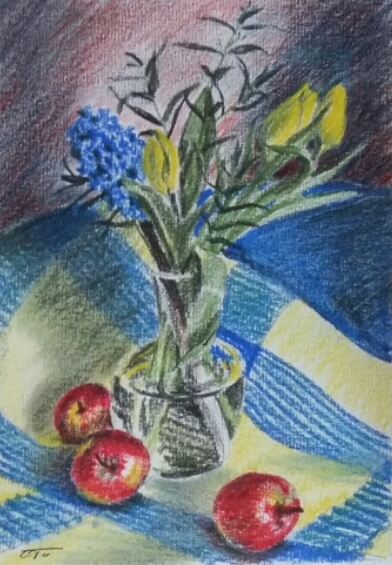 My assortment of coloured pencils was not quite working for me though, each type had noticeably different characteristics, including the need for applying fixative, which I wanted to avoid. I made the decision to clear out my stock, which I gave to the school art department for students to use, and invest in a new set of good quality coloured pencils. After trying a few different types out, I settled on the Koh-i-Noor Polycolour pencils, which have good quality colours and a nice softness without the powdery nature of pastel pencils. So now I am starting to explore and play with these nice new colours, it brings back that feeling I had as a child, the joy of simply making marks and building up areas of colour, even just in little thumbnail trials, as here. I’ll post more in a while, it’s too late to photograph the other sketches just now and I have started back at work. This entry was posted in drawings, Updates and tagged art, colour, drawing, response on 07/02/2016 by surfsensei. My little journey began in the studio at Trigonos, with a mug of coffee. The members of the group, from Art North Wales and Helfa Gelf, dispersed slowly and deliberately on individual explorations around the site, which offers many lovely perspectives on the area around Nantlle. I took my time, with sketchbook and paints in hand, to focus my attention on my whole experience of the stages of my walk, making notes in words as well as sketches. My route took me out to the car park, to greet and watch the chickens as they scratched and squabbled and chuckled to each other, apparently indifferent to the rain and wind and glowing softly in autumn coloured plumage. This entry was posted in Updates on 16/11/2015 by surfsensei. I’ve had a brief but relaxing trip to a campsite near St David’s in Pembrokeshire (Wales, UK). Three excellent days of reunion with friends, sunshine, warm rock to climb on, some small but clean waves to surf and comfortably cool water to swim in. I did also manage a couple of hours out sketcning, something I’m not doing enough of right now, in the face of other priorities. 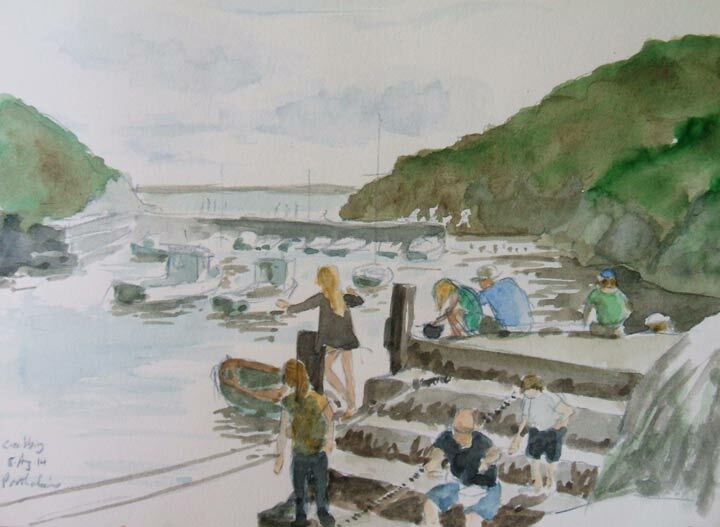 Here’s a sketch from a walk down to Porth Clais, where families were catching crabs while people jumped off the jetty at the harbour mouth. Tomorrow I start again on a portrait painting I began last October, as a demonstration in the Wolverhampton Art Gallery, where the Wolverhampton Society of Artists had its biennial exhibition. This entry was posted in Uncategorized, Updates and tagged outdoors, plein air, sketch, watercolours on 11/08/2014 by surfsensei.